Save 60% on Hot Blues lessons now! 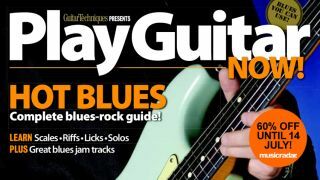 Get 60% off Play Guitar Now: Hot Blues until 14 July! Fancy instantly accessing hundreds of high quality HD video tuition for the instrument of your choice? Then MusicRadar On Demand is for you! On Demand is our premium tuition service for Mac OSX and Windows, designed to give you lucky people the chance to download top notch video tutorials for a host of musical instruments and styles, plus special edition content from the experts at Guitar Techniques, Guitarist and Total Guitar. There are hundreds of tutorial videos available for download, and each comes with an accompanying PDF. Categories include guitar, bass, drums, piano, blues, metal, jazz, folk, classical and much, much more! Browse the full On Demand range! Why use MusicRadar On Demand? Instant delivery with no shipping and handling costs - simply place your order and start watching in minutes! Instant access - watch anything you've purchased in just 3 clicks, whether you're online or not! Huge amount of choice - there are literally hundreds of videos to chose from, featuring lessons from the best in the business! How do I access MusicRadar On Demand? Using MusicRadar On Demand really couldn't be easier: you simply head to On Demand, chose your videos, set up your account to purchase and get learning! Check out our full On Demand FAQ for more details. For a limited time only, we're offering 60% off our Play Guitar Now! Hot Blues tutorial. Featuring scales recaps, advanced blues soloing, four full backing tracks to jam along with including classic major blues solo (think Bluesbreakers Clapton and Gary Moore); slow minor blues (Santana and Peter Green); Texas shuffle (Stevie Ray Vaughan) and up-tempo blues-rock (Led Zeppelin et al). It's a hell of a package for all budding blues hounds! To get your discount, head to MusicRadar On Demand and add the voucher code MRD02 at checkout, or head straight to the checkout. The offer is open until midnight 14 July 2013, so don't delay!